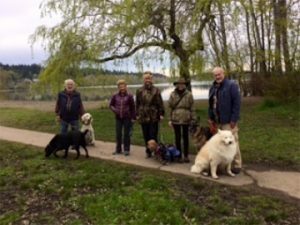 Walking with Dogs is for members who like to walk with others once a week with their dogs at various off-leash parks throughout Greater Victoria. This group meets on Friday mornings from 9:15 am. – 11:30 am. and walks for about 1 ½ hours at various dog-friendly locations: Beaver and Elk Lakes, Horth Hill, Island View Beach, and Thetis Lake, to name a few. We welcome any member and their dog(s) who would like to join us. Currently we are a group of five members with ten dogs. We are a fun group and we like to go for coffee after the walk. Your dog must be able to get along with other dogs and people, keep up with the group, and respond to their owner’s commands, to ensure a successful experience. Members are contacted each week to confirm who will be coming on the Friday walk and where the group will be meeting. There is no fee other than the cost of driving and coffee after the walk. For more information about this group, please contact Christine Smith at (250-727-8544).